One of the best things about being an academic and professor is that people send you free books! As a book connoisseur and enthusiast this is an aspect of the job that I hope will never loose its luster. I receive free books from publishers to adopt for my classes and I also receive them in order to review them for academic journals. I recently reviewed a great book from Irina Mukhina on Women and the Birth of Russian Capitalism: A History of the Shuttle Trade. 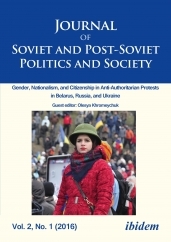 It was published in a special issue of the Journal of Soviet and Post-Soviet Politics and Society on Gender, Nationalism, and Citizenship in Belarus, Russia, and Ukraine. It is great to be featured among a number of notable gender scholars from my region and I am looking forward to receiving the entire paperback copy of the issue in the mail soon (yes, you also get a free copy of the journal when you write for it). You can also read my book review for free if you follow this link.